Doors come out in different styles but regardless of their distinctive features ought to secure properly since their main job is to provide sufficient security and insulation to the inner house. French doors are very special and used for internal use or to separate a room of the house from the patio, porch or terrace. FC Locksmith has the pleasure of working with some of the best French door specialists in Ontario who can install, replace and repair their locks efficiently. French doors usually have two glass panels and a metal or wood frame all around each door. One side may have a casement window at the height of the door and most of these panels will open outwards. They are a great idea for those who want a clear view of their garden or balcony since the transparent panels will allow visual contact and give you the impression of connecting the outdoors with the indoors. 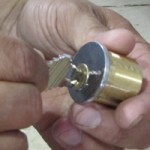 They are usually secured with espagnolette bolts, which consist of a handle that rotates about 90 degrees turning the metal rod in order to unlock the door. The rod has hooks and secures at both top and bottom of the door inside sockets. 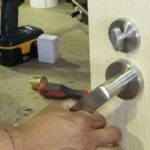 French doors locks are very special and you can be sure that our company can fix them should they are damaged. The special technical crews of FC Locksmith have the necessary training and knowledge of any French door service requested by our clients in Toronto. We have the best equipment and offer immediate 24/7 emergency services since we know the peculiarities of these types of locks and doors. We are the best in French door installation and ensure accuracy.